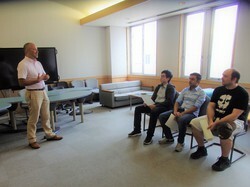 This association aims at supporting international students of the University of Aizu both physically and mentally. 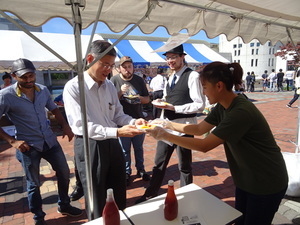 The donations of faculty and staff at the university, and donations from Fukushima Prefecture employees, labor unions, the Aizu Sangakukonwakai (Association for Aizu Industrial-University Relations) and from private citizens in the Aizu community allow the work of SAISUA to continue and flourish. We sincerely thank all donors for their continued support. 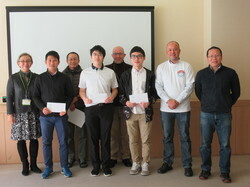 On Wednesday, March 27th, 2019, the SAISUA scholarship presentation ceremony was held at the 128 Conference room of the Research Quadrangles. 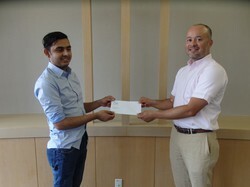 SAISUA provides international students its scholarships every six months so that they can concentrate on their studies. 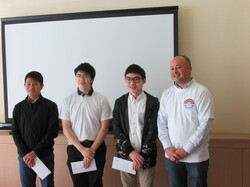 International students in need of financial support and demonstrating superior academic performance are selected as recipients of this scholarship. 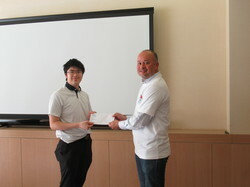 SAISUA gave the half of the total amount (90,000 yen) to the students this time. SAISUA President Julian Villegas explained the purpose of the scholarship and encouraged the scholarship recipients, saying "It has passed for 6 months and we are glad you have studyed hard and joined the SAISUA activity proactively. Please keep to focus on studying more and don't forget that you received such a great support from many people related to UoA. 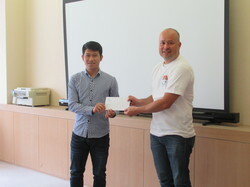 We wish you will have a oportunity to return what you received to other people like you." The scholarship recipients are as follows. 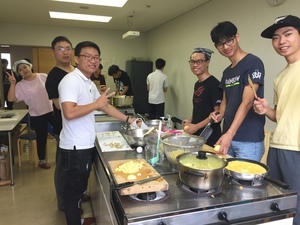 ・Chun Yin Mok (2nd-year Bachelor's student, from Hong-Kong) →He was absent the ceremony and SAISUA president gave the scholarship to him later. On Wednesday, November 21th, 2018, the SAISUA scholarship presentation ceremony was held at the 128 Conference room of the Research Quadrangles. 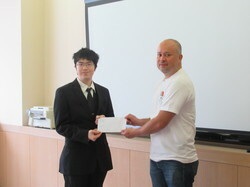 SAISUA provides international students its scholarships every six months so that they can concentrate on their studies. 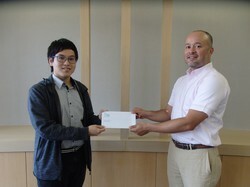 International students in need of financial support and demonstrating superior academic performance are selected as recipients of this scholarship. 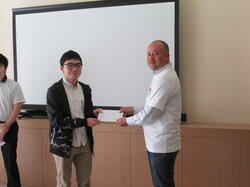 SAISUA gave the half of the total amount (90,000 yen) to the students this time. 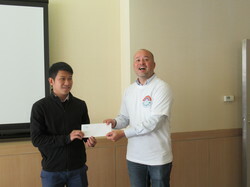 SAISUA President Julian Villegas explained the purpose of the scholarship and encouraged the scholarship recipients, saying "Hopefully, you can focus on studying and proactively join various activities inside and outside of the university with this scholarship. Also, I wish you would support SAISUA through donation, etc. for your juniors after graduation." 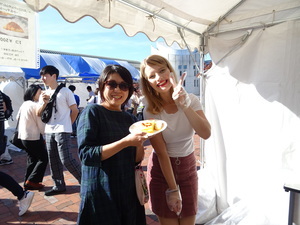 UoA School Festival "Soshosai" was held on October 6th - 7th, 2018, and SAISUA sold spanish tortilla at the festival. 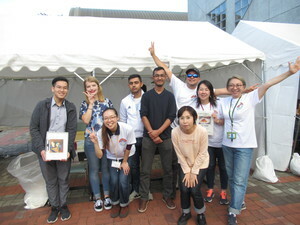 Some International students, faculty staffs and other staffs of UoA cooperatied each other, and so many visiters came to the SAISUA booth. 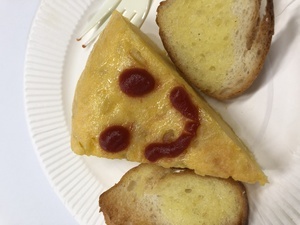 A total of 243 tortillas were sold for 2 days, and sales reached a record high of 106,738 yen. 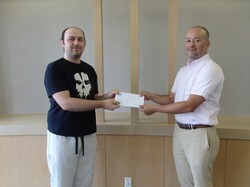 SAISUA also sold 38 SAISUA original T-shirts. 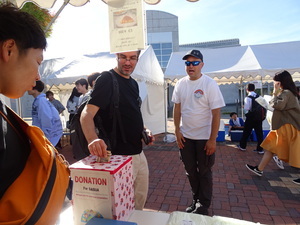 Many peole not only buy the food but also gave a donation in the donation box which was set up the booth, and it reached 17,803 yen for 2 days. We are extremely appreciate to everyone who helping and support us and visiting SAISUA booth! On Tuesay, June 26th, 2018, the SAISUA scholarship presentation ceremony was held at the South Lounge of the Research Quadrangles. 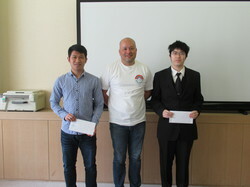 SAISUA provides international students its scholarships every six months so that they can concentrate on their studies. 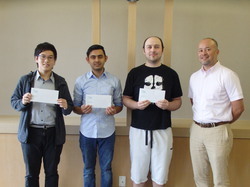 International students in need of financial support and demonstrating superior academic performance are selected as recipients of this scholarship.